WOW! I do love these big payment months. My monthly dividend income is getting pretty respectable and net worth is beginning to climb back up. I’m so excited about the progress I’m making with my dividend income. It’s my delight to report this month’s record breaking totals. This month I received $725.35 in dividend income. On average, I was paid $17.69 from a whopping 41 companies (or 40 companies and 1 fund). That’s a whole lot of paychecks! The big news is we are back to our huge monthly dividend income increases. Which is much more impressive as we are working with bigger numbers. 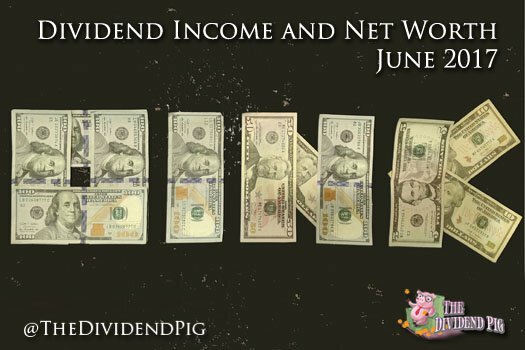 This month’s dividend income is a 87.69% increase over June 2016. This is a massive percentage increase! This month’s dividend covers my: cell phone, internet, electricity, water, gas and car insurance for the month! BOOM! Here is a chart of my passive dividend income progress over the last 2 years. With half a year in the books, I think its time for a quick six month review. 1.) Over the last half year, I’ve made $2,038.35. This is fine as I am pretty much on schedule to reach my goal of $4,320. To make sure I reach this goal, I do need to continue aggressively putting money to work. 2.) This has been a very active half year! I’ve already invested quite a bit this year in markets that have been less than ideal for dividend growth investors. While I’m not doing poorly by any means, I have not been buying at the values I would prefer. But, as I remember hearing in grade school over and over again “you get what you get, and you don’t pitch a fit”. I’ll carry on finding the best values of now and do my best not to complain. This month shows a huge increase due mostly to real estate. Unfortunately, this month we’ve had a few large surprise expenses come up. Fortunately, we have the cash on hand to cover them. First, my wife’s tires needed to be replaced…$800 later (ouch!) and she is now riding on gold. We also had to pay a little over $1,000 in fees to refinance our home. Other than that, we have been working hard at cutting back our unnecessary spending and seem to be doing a good job. As you can see, the gigantic increase this month came from rental property #1. Well, as it turns out the units (it’s a condo) are selling quite well right now. One sold last week just like ours for almost 250k. There is a strong chance that we will take advantage of this interest in the area and sell the unit. As there is no mortgage on this property, there will be a lot of cash floating around that will need to find a home. I’m debating about either investing it or paying off our mortgage… completely! Having no mortgage sounds very enticing, especially with current valuations so high. So all in all, it’s been a fantastic month. Dividend income investing is continuing to prove itself. I’ll continue to invest in the best values I can find. I still have a long way to go before I can retire, but every month I get considerably closer. Seven years is going to fly by! What would you do if you had a windfall of cash from a rental property sale? Would you pay off your mortgage or invest it in the market? Great detail in your Net Worth, thanks for sharing. I especially like how you liabilities are a small fraction of your assets. 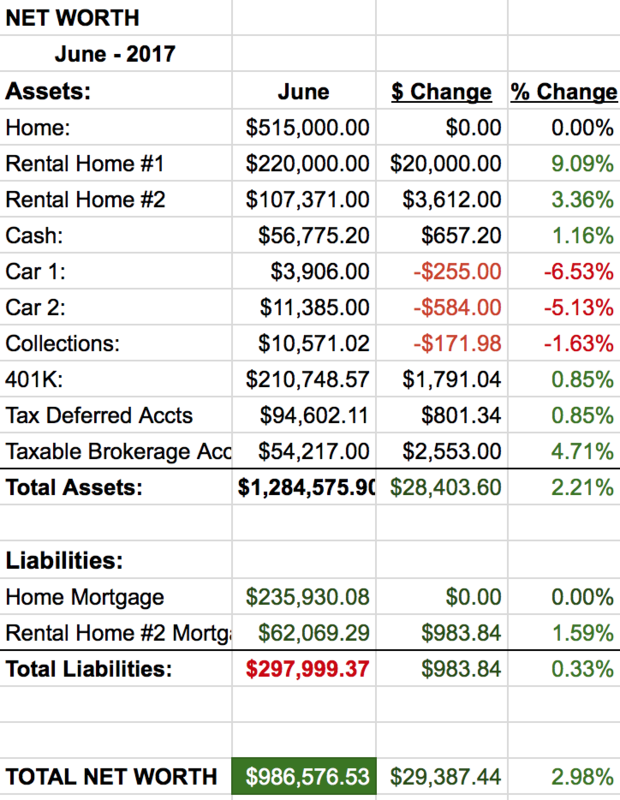 Still have a long way to go to get rid of those liabilities, but selling rental property #1 certainly could help out a bunch. Congrats on an awesome dividend income month. Insane year-over-year increase. Nice work. Hopefully we can keep finding decent dividend growth stock values to invest in! Congrats on a great month! You’re so close to hitting the 7 figure mark! Way to go! Thanks GYM! It will be great when it happens. However, my ultimate goal is receiving enough dividends income to cover my monthly expenses.